Something that really irritates me and goes on my nerves is to witness friends and other good people that are endlessly into doing things that are very healthy. I'm talking about people that only eat healthy food (in their opinion), only drink coffee in moderate amounts (or skip it altogether), drink nutritional drinks, work out regularly (although they force themselves to do it - they have the willpower), they never drink, smoke or curse! But why this comparison? I think that one of the main reason for peoples unhappiness is when they compare themselves to others all the time; our abilities, circumstances and the way we look. Why not be thankful for who you are and maybe try to better yourself a little every day - if you feel like it. One thing is to have a role model that is inspiring (like mine; Tina Turner), another is to look at oneself as a lesser person because.... of just something. I would never support anyone looking at themselves as being superior to others (like me and the drunks in the street).... Arrogance in itself often expresses low self worth and is a boring, bad and dreadful habit. In Iceland it is very trendy at the moment to swim in the ice-cold see! People do this regularly and talk a lot about how great it feels - it probably is very healthy and extends your life and looks. It's just that it isn´t something I like - I would rather take a warm bath and I would never dip my toe in ice-cold water if I could avoid it. 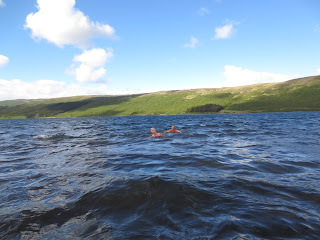 My irritation and low self esteem where tested the other day, when I spent a weekend with a "see swimming" girlfriend who took a swim in the ice-cold Skorradals lake and seemed to enjoy it very much... 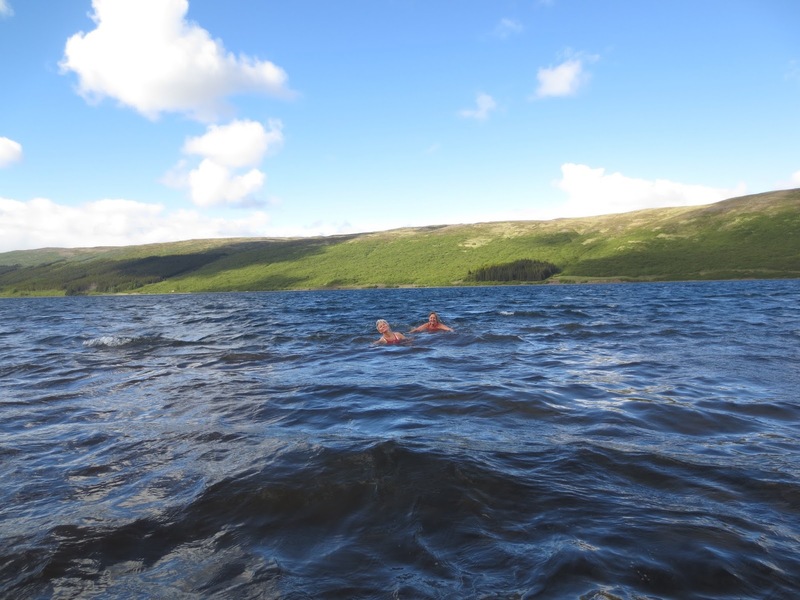 I forced myself to go outside in the cold water and had my picture taken - smiling! And would you belief, I managed to smile an almost genuine smile... for those 5 long seconds! I encourage everyone to try something new - to step out of their (un)comfort sone and to test some of the cosy things life has to offer. Tekur virkilega á pirringstaugar mínar að vera vitni að vinum og öðru góðu fólki sem eru óendanlega dugleg að gera eitthvað heilsusamlegt. Ég er að tala um fólk sem borðar bara hollan mat (að þeirra mati) drekkur kaffi í hófi (eða sleppir því alveg) drekkur sérstaka næringardrykki, hreyfir sig reglulega (jafnvel pínir sig til þess – viljastyrkinn vantar ekki), það drekkur ekki, reykir ekki og blótar ekki. En af hverju þessi samanburður? Held að rekja megi stærstu óhamingju okkar til samanburðar á hvert öðru; getu okkar, aðstæðum og útliti. Af hverju ekki bara að þakka fyrir sjálfan sig og bæta sig kannski örlítið dag frá degi - ef manni langar og maður nennir. Eitt er að hafa góða fyrirmynd sem er hvetjandi (t.d. mína; Tinu Turner), annað að finnast maður vera sá eða sú sem er ‘verri’ en einhver annar – af því bara. Mæli þó ekki með að finnast maður betri en aðrir (sbr. ég og rónarnir)... Hroki er minnimáttarkennd í felubúning og er bæði ljótur og leiðinlegur löstur. Nú er í tísku á Íslandi að fara í ískalt sjósund! Fólk stundar þetta og dásamar áhrifin – sem vafalítið eru holl og lengja bæði lífið og lúkkið. Ég sjálf fíla bara meira að fara í heitt bað og dýfi helst ekki tánni í kulda ef ég kemst hjá því. Pirringurin og minnimáttarkenndin fóru alveg með mig um daginn er ég var í bústað með 'sjóleginni' vinkonu sem synti með ánægju og hreysti í íííísköldu Skorradalsvatni... Ég dreif mig því sjálf út í kuldann... og lét smella af mér mynd - brosandi! Og viti menn, ég gat þetta alveg... og brosið var næstum eðlilegt... þessar endalausu 5 sekúndur. Hvet alla til að prófa eitthvað nýtt - stíga út úr (óþæginda)rammanum og testa þau notalegheit sem lífið bíður upp á.